The Supreme Court has given financial institutions and employers a license to do wrong—and it’s hitting the poor especially hard. For more than forty years, the Supreme Court’s conservatives have been engaged in a campaign to shut the courthouse door to consumers, working people, small businesses and others seeking redress for corporate wrongdoing. 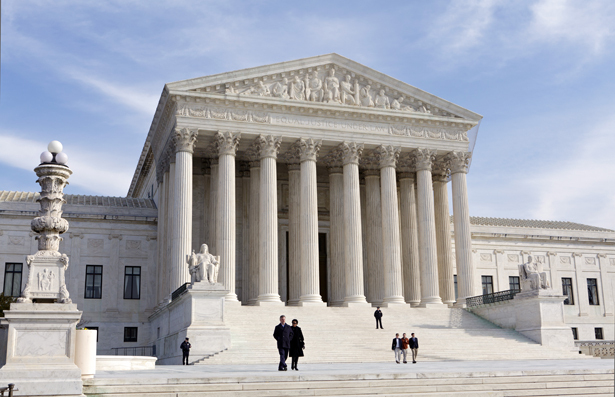 In recent years, and especially since Chief Justice John Roberts and Associate Justice Samuel Alito joined the Court, a major weapon in this campaign has been the Federal Arbitration Act (FAA) of 1925. The conservatives have used the act to prevent victims of such abuses from seeking redress in the courts, forcing them into pre-dispute arbitration instead. In doing so, they lose a public trial, a jury and a neutral judge, as well as an appeal to a higher court; in many cases they may also have to give up discovery rights. It is not uncommon for them to wind up before an arbitrator who is dependent upon the defendant’s business community for work and fees, and who may not even be legally trained. Not surprisingly, those forced into arbitration almost always fare much worse than they would in court. This past term the Court paused in its campaign to keep ordinary people—but no for-profit corporation “persons”—out of the courts, though it did make it harder to bring class actions by victims of securities fraud. Instead, it concentrated on overturning or undercutting long-established rulings protecting women’s reproductive rights, unions, affirmative action and church-state separation. The Court didn’t need to issue any more arbitration decisions. Two reports issued at the end of last year show how effective the Court’s arbitration rulings have been. Last December, the Consumer Financial Protection Bureau (CFPB) issued a preliminary report, which found that contract clauses mandating pre-dispute arbitration are a “common feature of consumer financial contracts”; a final report is due by year’s end. The agency found such clauses in over 50 percent of credit card loans, 81 percent of prepaid charge cards and in checking accounts covering 44 percent of all insured deposits. The CFPB found further that about 90 percent of such contracts, including almost all credit card loans, insured deposits and prepaid cards, also prohibit participation in current or future class or other joint actions in both judicial and arbitration proceedings. This usually forces consumers who have been injured in small amounts to drop the matter entirely, even though the defendant may have harmed many others the same way, for too little is at stake for each individual to justify the time, trouble and expense of individual arbitration. These two clauses are not just in consumer financial contracts, but are standard in cellphone and nursing home contracts, individual employment contracts, shipping agreements, passenger tickets and in many other areas. They have also been imported into the exploding commercial traffic on Internet websites. When consumers click their assent to the conditions imposed by a seller online, few if any realize they are often acceding to these limitations on their rights to a judicial resolution and a class action. Some merchants have gone so far as to claim that just opening a box for a computer, for example, is enough to constitute the necessary assent to such conditions in an “agreement” placed in the box. The consequences of these clauses were reported this past November. A group of corporate defense lawyers triumphantly reported that since 2011, when the Supreme Court ruled in AT&T Mobility v. Concepcion that the FAA did not allow state courts to nullify class arbitration waivers in consumer cases even if those courts considered them “unconscionable,” plaintiffs had been forced to arbitrate individually in 72 percent of 375 cases. According to a study by Public Citizen’s Congresswatch, at least 139 class actions have been dismissed since Concepcion. Concepcion involved federal pre-emption of state law, but in another 5-4 decision, handed down last year, the Court’s conservatives went even further. Over a powerful dissent by Justice Elena Kagan, the Court insisted in American Express Co. v. Italian Colors Restaurant that an antitrust suit be arbitrated individually, thereby preventing the effective vindication of federal rights long established by Congress. Earlier, the Court had ruled that if arbitration prevented “effective vindication” of federal rights, arbitration would not be required. The Italian Colors decision meant that this small restaurant and other merchants in the proposed class had to drop their claims, even though American Express may have blatantly violated the law, wronging hundreds and perhaps thousands of other customers. Just beginning an antitrust action, whether in arbitration or in court, can cost an immense amount of money up front. No small business or consumer can afford to go it alone, and no lawyer would take such a case. Since Italian Colors, the lawyers reported, defendants have won 84 percent of the eighty cases decided, and plaintiffs have not won a single case in which a class action waiver was enforced. The Italian Colors decision seriously undermines the deterrent effect of antitrust and other regulatory measures. Public authorities do not have enough resources to enforce these laws on their own, so private suits are essential if the laws are to have any deterrent effect. That’s why laws provide for punitive damages and attorney’s fees. Contracts like these are not negotiated agreements between equal parties. They are applications for services. Known in the law as “adhesion contracts,” they are standardized agreements drawn up by business lawyers, with the arbitration and class waivers usually placed in dense paragraphs in fine print that is unreadable. Few people know about the clauses, fewer read them and even fewer can understand them. Consumers and others who sign such contracts certainly do not “consent” to these conditions in any meaningful sense of the word. Not surprisingly, a 2012 Pew Charitable Trusts report on the use of arbitration in banking found that “consumers overwhelmingly find the majority of arbitration [procedure] components unacceptable.” But they have no choice—almost everyone needs banking and other services, and these “agreements” are offered on a take-it-or-leave-it basis. As a partial remedy, in the Dodd-Frank Act, Congress banned the use of arbitration clauses in most residential mortgages. It also instructed the CFPB to study the use of pre-dispute arbitration contract provisions in consumer financial products or services, and to report its findings to Congress. Although the final report has not yet been issued, last year, Senator Al Franken and Representative Hank Johnson introduced the Arbitration Fairness Act of 2013, barring arbitration in consumer, antitrust, employment and civil rights disputes. Similar bills have been introduced in the past seven years, but all have gone nowhere; this bill is not likely to do much better. In the meantime, the House Financial Services Committee, chaired by Tea Party Congressman Jeb Hensarling, has before it a bill depriving the CFPB of all regulatory jurisdiction over arbitration. That bill is also likely to go nowhere. These recent Court decisions forcing individual arbitration hit the poor especially hard. In North Carolina, payday lending is illegal, but no individual judicial or arbitration proceedings had ever been filed, despite many illegal loans. Paul Bland, executive director of Public Justice, a public interest law firm for victims of corporate abuse, says that in cases resolved before Concepcion, his firm sued on behalf of payday borrowers and obtained more than $45 million in three North Carolina cases, and $20 million in four Florida settlements. After Concepcion, nothing: payday class actions that were still pending were dismissed, leaving these low-income borrowers with no recourse. This isn’t what Congress intended in 1925 when the FAA was passed. The primary purpose of the act, which was promoted by New York businessmen and the American Bar Association, was to enable merchants who had commercial or maritime disputes with each other to avoid federal court litigation by agreeing to use a less formal, less expensive and much speedier procedure. Those who drafted it assured Congress that it should not and would not apply to adhesion contracts or to any workers engaged in interstate commerce; Secretary of Commerce Herbert Hoover had insisted on the latter. Congress also assumed that the act would not apply to state court litigation, and since it was only a procedural device, it would not override any substantive rights, state or federal. During its first fifty-eight years, the FAA was enforced that way. In the 1980s, however, the Supreme Court began to read the act to favor arbitration over judicial proceedings, regardless of the nature of the dispute. With no basis in either text or legislative history, the Court created a presumption in favor of arbitration over judicial proceedings. It also ruled that the act could override any state law that the Court deemed inconsistent with arbitration, even laws intended to prevent arbitration abuses. And in 2001, in Circuit City Stores, Inc. v. Adams, the five conservative justices applied the act to employer-employee agreements, despite the clear text and legislative history, limiting the specific exemption in the FAA for labor agreements to the transportation industry. A 2011 Cornell study found that workers have a much lower chance of winning in arbitration than in courts, and obtained smaller recoveries when they do win an arbitration, especially when the same arbitrator handles more than one case with that employer. This, of course, is not to say that arbitration is always a bad thing. It can be cheaper and faster than judicial litigation, although it can also be quite expensive. But mandatory pre-dispute arbitration and class action waivers have no place in contracts of adhesion. There are things that can be done. Businesses that deal with consumers depend on their good will, so an aroused public opinion can make a difference. General Mills recently tried to slip in mandatory arbitration and class waiver clauses when the company’s website was used for services and other offerings, but after consumers lit up Facebook and Twitter with their anger, General Mills dropped the clauses. At the very least, consumers, employees and others should pressure their state governments, as well as federal and state regulatory agencies, to require that these clauses be set out in clear, separate text so that people can know what they are agreeing to. None of this can happen, however, until consumer groups and others, together with allies in Congress, the states and the media, alert Americans to the fact that they are losing one of their basic rights—access to justice.